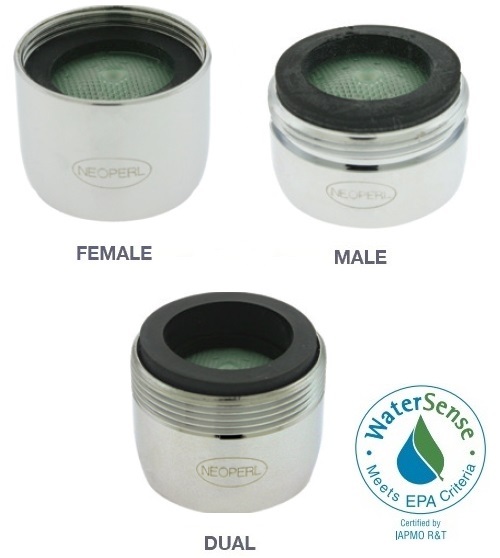 Conserve Water with 1.5 GPM Faucet Aerators from Conservation Warehouse - NEOPERL PCA Perlator SSR Aerator, 1.5 GPM, Regular Size Adjust the Angle of the Water Stream - No More Splashing! Adjust the Angle of the Water Stream - No More Splashing! 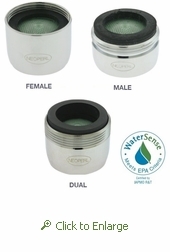 The NEOPERL SSR 1.5 gpm faucet aerator allows you to easily adjust the angle of the water stream by simply moving the adjustable tilting plate. Attainable swivel angle depending on the aerator model: +/-6° up to +/- 10°. Sometimes when a faucet is installed with a wash basin, the faucet stream direction is less than optimum (water splashing, difficulty rinsing hand). NEOPERL designed the SSR to allow adjustments in the water stream direction on site without having to replace expensive faucet or basin. In the basic position there is no visual difference to the standard version.